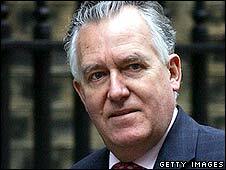 Police have handed over evidence relating to donations to Peter Hain's deputy Labour leadership bid last year to the Crown Prosecution Service. It follows an inquiry into the late declaration of more than £100,000 given to his failed campaign. The Metropolitan Police said the CPS would say whether more inquiries were needed or charges should be brought. Mr Hain, who quit the cabinet over the issue, said he wanted to clear his name "as quickly as possible". He ran to be Labour's deputy leader but came fifth out of six candidates in last year's contest. All those taking part should have told the Electoral Commission about any donations towards the campaign. Mr Hain has admitted that although he declared £77,000 on time, a further £5,000 was not declared until November - and in January admitted that a further £103,000 should have been reported. In total, 17 donations were reported late to the commission. After the case files were handed to the CPS, Mr Hain said: "As I have said all along this was a mistake by my campaign, but an innocent mistake. "When I discovered the problem it was I who immediately notified the authorities that a number of donations had been declared late. "I have consistently provided them with all the information they might need, and I hope to see my name cleared as quickly as possible." A Metropolitan Police spokesman said: "We have had regular consultation with the CPS since the inquiry began and it is now a matter for the CPS to consider the evidence, advise us on whether any further enquiries are necessary and whether any charges should be brought." Under the Political Parties, Elections and Referendums Act 2000, donations have to be reported within 60 days of being offered. Before he resigned to "clear my name", Mr Hain, Labour MP for Neath, had been the work and pensions secretary and Welsh secretary.